An ordinary Russian family in 1993 adopted a three-month-old bear cub which was struggling to survive. We recount the story of how they managed to turn this wild animal into a cute and cuddly pet. 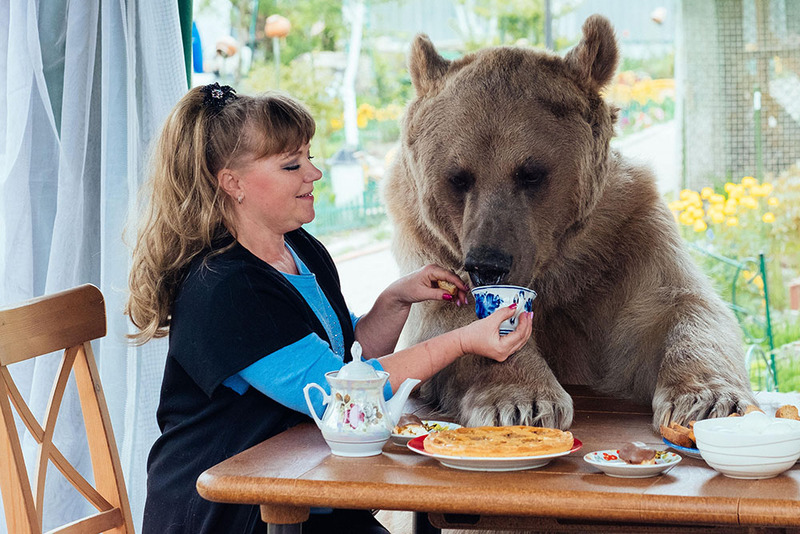 Despite the associations, it is not usual for bears to live in Russian families as pets. There is, however, a family that lives with one in the house. The bear is called Stepan. He is 23 years old and has his own website. He is around 2.25 meters (about 7 feet 4 inches) tall and weighs in at 350 kilograms (around 772 pounds). Although he qualifies as a senior citizen (bears live up to an average of 25 years in their natural habitat), Stepan can dance a "Gypsy Girl" and waltz with his mistress. Yury and Svetlana Panteleyenko got a call in 1993 from friends, asking them to take a bear home with them. A small circus in St. Petersburg was no longer able to feed its animals and was seeking every opportunity to save those that could not find a shelter elsewhere. The cub had no fur. Its bones were visible beneath its discoloured skin, and sick and blackened teeth were protruding out of his mouth. The bear was named Stepan and the first few years of life together were dedicated to nursing him back to health. He was fed every three hours – Svetlana and Yury gave him milk from a bottle, porridge and eggs. They regularly took him to a local veterinarian and, over the years, the “ugly duckling” has turned into a giant brown bear. When Stepan turned five years old, he began performing on tour and achieved considerable success in circus arenas. By this time, his new “parents” finished a circus course and obtained a certificate confirming their status as professional trainers, which gave them the right to keep the bear in their house. The family travelled around the world. The Panteleyenko family toured throughout Latin America and visited Japan as part of a concert programme. However, the bear was having a tough time with all those flights, from one end of the planet to the other, so eventually the family decided to abandon circus life. Stepan today works as an actor and model. He has starred in movies by such famous Russian directors as Pavel Lungin and Alexei Uchitel and regularly appears on TV and in commercials. However, Stepan played only evil characters until recently, chasing someone, tearing them apart or eating them alive. However, according to the Panteleyenko family, the “actor” has finally been able to wear a different hat and show the world who he really is; a kind and responsive circus bear. Stepan lives in a country cottage near Moscow with his “parents.” He has his own plot of land with a small den and a pool. However, he spends almost 24 hours a day around Svetlana and Yury: walking, playing and communicating with them. Most of all, the bear loves to wrestle with Yury, sleep up to 12 hours at a time and eat. He consumes around 25 kilograms (55 pounds) of fruit and vegetables every day. He does not eat meat. According to the Panteleyenko family, despite the fact that Stepan weighs 350 kilograms, he can sit with them at the same table or lie on their leather sofa and watch TV. When the bear sees something interesting, he starts to repeat the behaviour of people.